When people enter Gould’s Book Arcade on north King Street, Newtown, for the first time, they walk in a few steps then pause, beholding the complex interior. Like an M.C Escher puzzle, Gould’s is a maze of books, a million of them or more, extending back in rows for as far as the eye can see. There looks to be no end to the books, that they might stretch back to infinity. But Gould’s Book Arcade is at an end, at least in its current form. Its last day at its present location, where it has been for 29 years, is this Sunday. Then the moving and downsizing begins, as the store moves on to smaller premises at the south end of King Street. A sign at the entrance announces that there’s a moving sale: 50% off. I pause, as I always do, to take in the scene of plenitude. I’m standing under the painted copy of the Diego Rivera mural, Man at the Crossroads, that hangs on a side wall. Rivera’s original mural had been painted in the lobby of the main building of the Rockerfeller Center in 1933, only to be destroyed, chipped off the wall for its communist themes, as Rivera refused to remove the portrait of Lenin. The replica mural in Gould’s Books is a statement of intent: Bob Gould’s name is equally as connected with left-wing politics as bookselling. An entire wing of the store is stocked with political books with titles like Dynamics of World Revolution Today and Socialism and Survival. Although Bob Gould died in 2011, after a fall in the shop, his political legacy, and his bookstore, live on. Gould’s has its own topography. The heights of the mezzanine level with its view over the landscape of shelves below; the gloomy recesses of the Australiana aisle, where I activate the torch on my phone to crawl around on the lowest levels, in search of 1970s Sydney photobooks; the narrow aisles of “serious fiction”; and the Cat Pathway at the back of the store, the only surface where there isn’t a stack of books, although the cat is no longer in residence. In one of the many news articles that were published last year, when news of the store’s relocation was announced, the sad tale of the cat – run over – was revealed. The articles ran to the same theme, differently inflected depending on the political leanings of the newspaper. There is no longer space in gentrified Newtown for huge, rambling bookstores. It is easy to feel overwhelmed by Gould’s, even in its last days. The stock has only barely perceptibly thinned-out. I follow my usual route, down through the arts and crafts books, Introduction to Copper Tooling, How to Make Stained Glass Lampshades, then into the Feminist section, with its row of dark green Virago editions with bitten apples as their logos, then on through fiction, and upstairs, past the political books, to the very front corner. Here Karl Marx watches over me as I flip through the 80s-era posters of puppies, tall ships, and star signs (only Pisces and Sagittarius remain). During a deep session in Gould’s, time seems to dissolve. It is many hours later when I emerge blinking back out on the street, and wait for the bus home under the red sign and the faded, peeling movie posters that have canopied the street for decades. The names of some can still be made out but most, by now, have worn away. Apart from Mirror Sydney, my other project this year has been Ninety9, my recently published memoir of growing up in Sydney in the 1990s. A lot of the book is about music: my early teenage years coincided with the shift in pop culture in the early 1990s in which the newly labelled “alternative” culture flourished. Music, zines and community radio were all an important part of connecting me with a more underground version of Sydney, but there was nothing like visiting Glebe and Newtown to make my misfit self feel as if I’d found my true home. The author, at a late 90s Reclaim the Streets, when the Oxford was still the Oxford. When I walk along King Street it’s through a patchwork of time and memories. What is there now mixes with what used to be there and other less fixed memories: rumours, other people’s stories, displaced memories that are vague enough to be like dreams. I first visited King Street as a teenager. I’d try on secondhand clothes at The Look or go to the night markets in Burland Community Hall, or just watch the people a little older than me, goths and punks, people with bright hair and weird clothes, whose lives I hoped to emulate. I soon started seeing bands at the Sandringham Hotel and at Feedback, the venue above Newtown Station with rickety back stairs on the edge of a precipice above the train tracks. When I moved out of home in 1997, spray painted in huge letters on the wall alongside the Footbridge Theatre on Parramatta Road were the words: Don’t Move to Newtown. These words were no doubt directed at the influx of suburban misfit teenagers like me, who had grown up aspiring to live on King Street and were now finally old enough to move out of home. Despite the fact many had come before me, I felt that King Street and the inner west was the home that I had chosen, rather than the home I was born into. I browsed books at the Cornstalk Bookshop, drank cheap carafes of wine at the Happy Chef and long blacks at Cafe Solea, spent late nights at the Oxford Hotel writing stories on beer coasters with my friends and going to parties in Newtown back streets. On King Street these days I often navigate by what used to be there rather than what is, and use the mainstays as landmarks. There’s the “Goulds end” of King Street, and I still call the building above the station Feedback (others might call it by its previous names: Tracks, or “Toucan Tango” as it was in the 80s, with a giant Toucan and palm trees painted on the facade). Despite moving much further along the gentrification scale, and the sudden proliferation of frozen yogurt stores, there is still plenty of 90s Newtown around. I decided I’d make a map to record the places that remain and those that are no longer. I started by making a map from memory, listing the places I remembered best. Then I discovered that on Archivepix there are photos of every building on King Street in 1991, which were taken for a study of heritage paint colours. Search “heritage paint scheme 1991” and you can travel all the way down King Street in 1991! It was before my time but it was lots of fun to see desolate south King street and Coles where the Dendy is now, and the Coopers Arms as the Shakespeare Hotel, the old cars, the people caught in mid-stride. 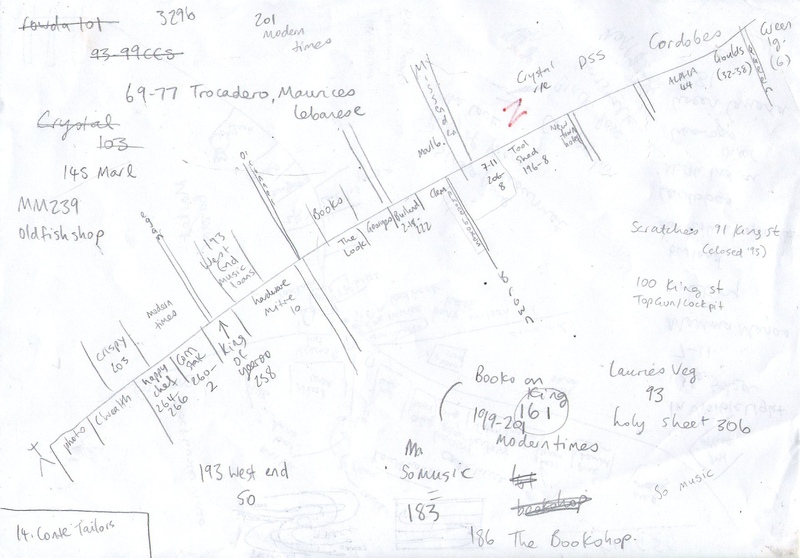 From this, and old address listings online, I made a version of the map with street numbers. Things were taking shape. I struggled with matching up the sides of the street and working out the placement of the side streets, but eventually came up with a hand drawn King Street I was happy with. There was a lot to include and so I decided to focus on the area from the Sando to Goulds. Finally I put it all together. 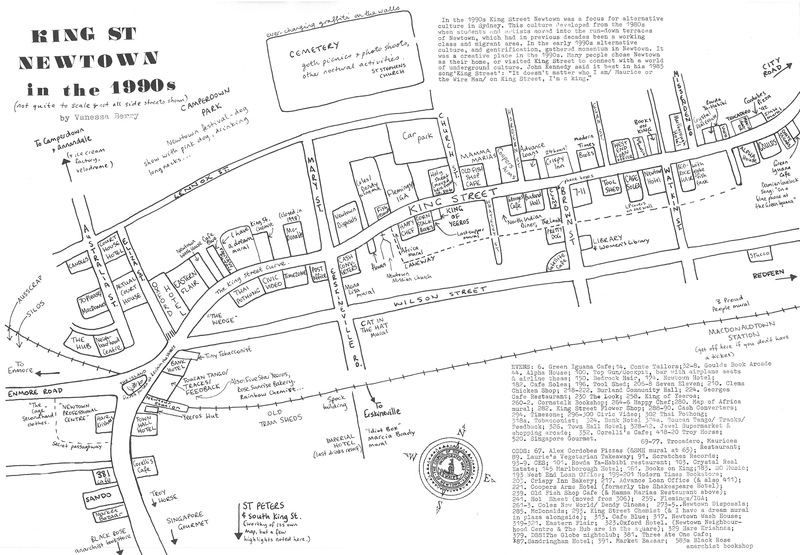 Here, dear readers, is the 1990s map of King Street, Newtown. 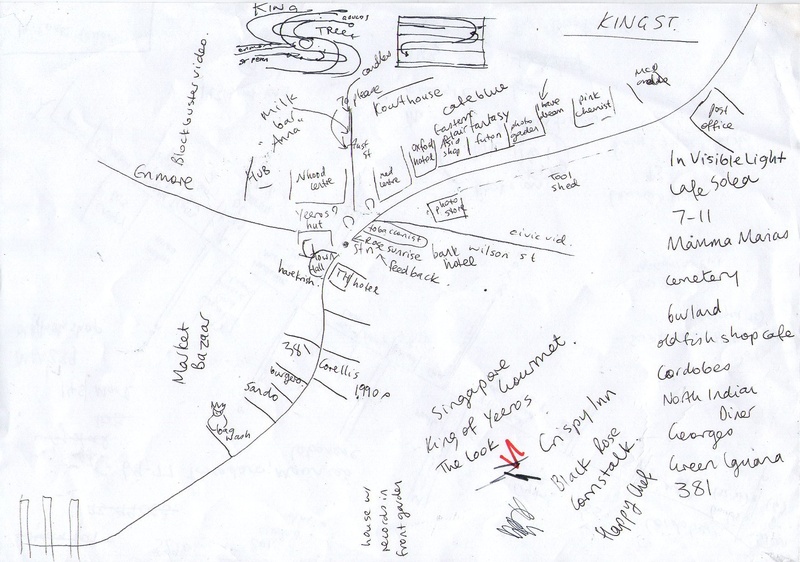 Comments, suggestions, additions welcome – please let me know if there’s anything I’ve missed or if you have a particularly strong King Street memory in any of these places. 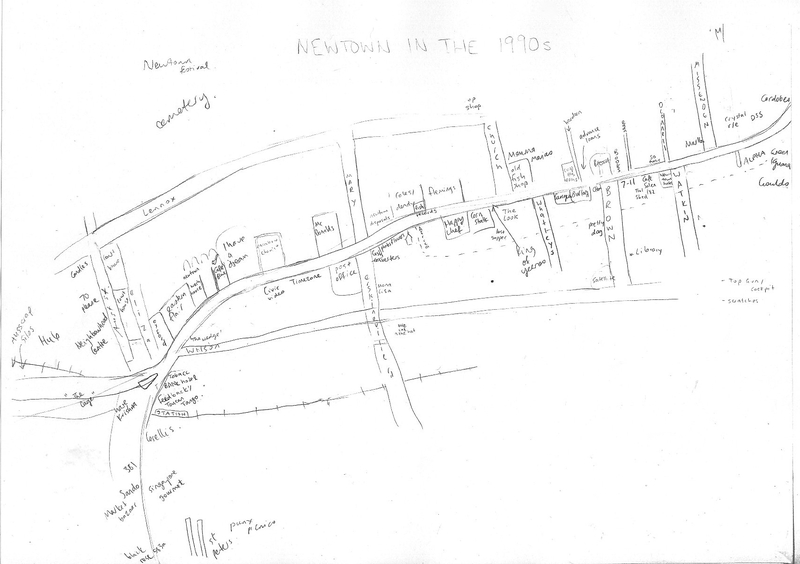 I’m doing a walking tour of 1990s Newtown as a tie in with my recently released Memoir Ninety9, and as part of it I’m making a map of King Street in the 1990s. 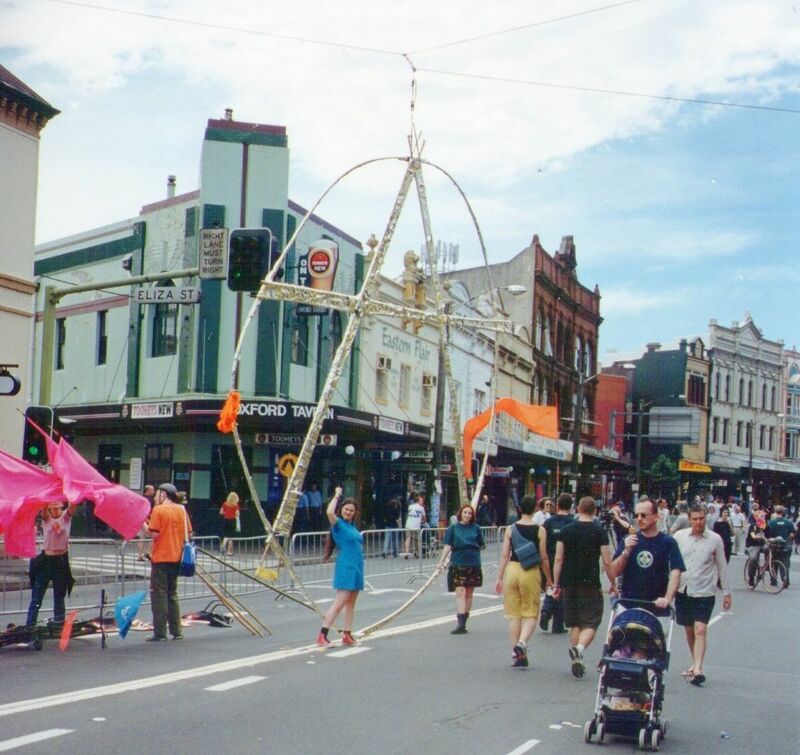 No particular year – though it is strongest with mid-90s, which is the era I started visiting Newtown regularly. It’s still a work in progress but I thought I’d post it here and ask what else would be good to include before I make the final map. So please do comment if there’s anywhere you remember that would be good to include (click to enlarge).